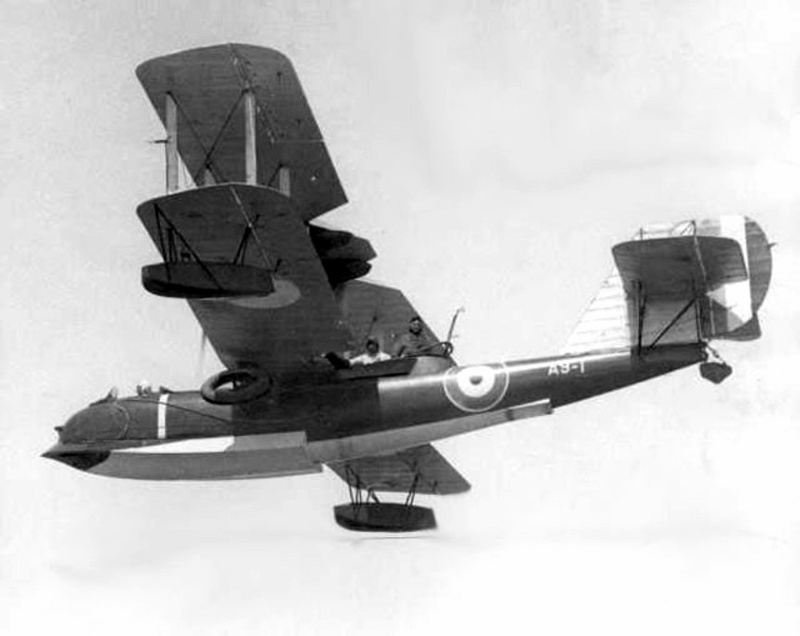 The Supermarine Seagull III was a British designed and built amphibian bi-plane. The prototype, the Seagull I, was developed in 1921 and this led to improvements for the construction of 25 Seagull II, in 1922, for use by the Royal Navy and Royal Air Force. Further improvements resulted in the Seagull III, fitted with a Napier Lion V engine, becoming available in 1925. The Royal Australian Air Force (RAAF) ordered six of these aircraft in 1925 to replace its Fairey IIID seaplanes at a cost of £ 8,000 each. The aircraft were freighted to Australia arriving in mid-1926 with the first test flight conducted in June of that year. A further three aircraft were ordered in 1927. The Seagull was constructed from timber and canvas and the Australian version had a radiator modified for tropical usage. The lower wing was set in the shoulder position and the engine was mounted in a nacelle slung from the upper wing; powering a four-blade propeller in ‘tractor’ configuration. The aircraft carried a crew of three with the pilot being a RAAF officer, the observer (navigator) a naval officer and the telegraphist air gunner a naval rating. The Seagulls were allocated to 101 Flight RAAF and three aircraft took part in the Great Barrier Reef Survey during 1926-27 and were based at Bowen in far north Queensland. Due to their size and the logistics / engineering needs the aircraft were based ashore and carried out regular flights over the reef to conduct photographic surveys in support of survey work being conducted by HMA Ships Geranium and Moresby. The Seagulls were normally located at RAAF Base Point Cook, Victoria but following the commissioning of the sea plane carrier HMAS Albatross, in January 1929, they were embarked regularly for training exercises; where the aircraft proved very useful in spotting, and signalling corrections, for the fall of shot during gunnery practice firings. The Seagulls were also employed on reconnaissance flights where they were also adept in locating other vessels and signalling, via wireless telegraphy, the location of the ships. The range of the wireless telegraphy equipment was however only 30 kilometres in good weather conditions. They did have other limitations - due to there being no catapult installed in Albatross the Seagulls had to be craned off for each launching and craned back on once they had landed alongside the ship. Up to six Seagulls could be embarked in Albatross in her hangar and then ranged on her forward deck for impending flights. Thus flying operations were heavily dependent on weather and sea state. Deployments to New Guinea waters where undertaken to test the Seagulls performance in tropical conditions and the aircraft proved repeatedly that it could take off with a full load without difficulty. On 19 March 1930 Albatross was operating in Tasmanian waters when Seagull A9-4 crashed in Norfolk Bay. The pilot and observer survived the crash but 21 year old Acting Leading Telegraphist Donald McGowan became wedged in the rear of the fuselage and drowned. He was buried with full naval honours in Hobart. Seagulls could also be embarked in the heavy cruisers HMA Ships Australia and Canberra. Again the aircraft had to be craned on and off the ship for flying operations due to the inability to use a catapult system. In late 1932 both cruisers embarked a Seagull during their deployment to northern waters and the aircraft embarked in Australia conducted extensive photographic reconnaissance of islands between the Torres Strait and the Solomon Islands. After Albatross was placed in reserve, in April 1933, the Naval Board requested a Seagull III be permanently allocated to each of the heavy cruisers. Two Seagulls were damaged beyond repair while operating from the cruisers during 1934-35; both due to extreme bad weather when lashed down on deck. The last Seagull III was operated by Canberra during 1935-36 and was disembarked at Point Cook on 3 March 1936. The Seagull III was an effective aircraft for use by warships but were well and truly out of date once the catapult launched Seagull V (Walrus) became available. Top Left: A Seagull III being craned on board the seaplane carrier HMAS Albatross. Top Right: Moving a Seagull III on the forward deck of HMAS Albatross. 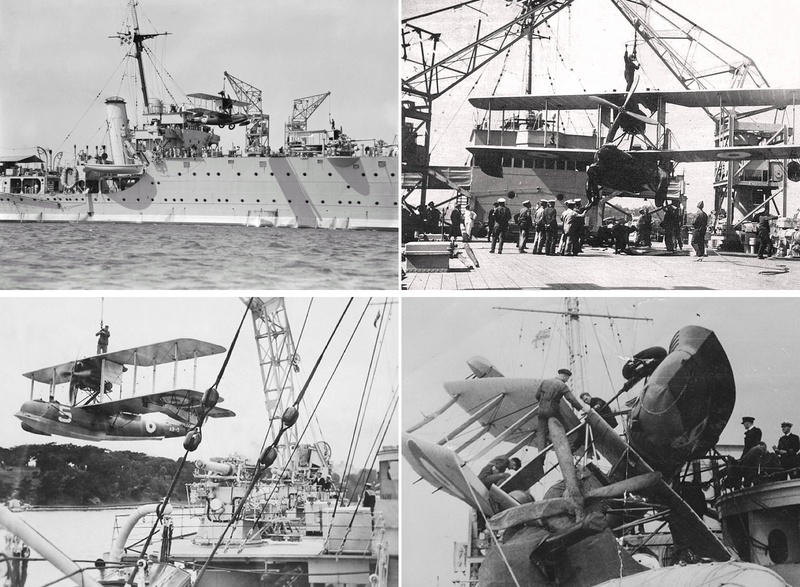 Bottom Left: A Seagull III being craned on board the heavy cruiser HMAS Canberra at Garden Island in 1934. Bottom Right: A wrecked Seagull III on board HMAS Canberra following a storm.